Nepal is a historic and natural wonder of sorts, so you could imagine how ecstatic I was when I had the chance to visit this amazing destination last year whilst I did various fun things to do in Kathmandu! FYI: To best clarify the difference between Kathmandu city and Kathmandu Valley, you must first understand that the Kathmandu Valley is made up of 3 beautiful ancient cities, namely: Kathmandu (the largest city and capital), Lalitpur (also called as Patan), and Bhaktapur — . As such, these 3 places that make up the Kathmandu Valley have an enthralling mix of sights, smells and sounds, as well as an awe-inspiring number of temple complexes and squares. As a matter of fact, this 220sqm region has become a place that has the densest concentration of UNESCO World Heritage Sites in the world! That being said, for such an intoxicating place like this, you would surely need to be on top of the best things to do in Kathmandu city or the valley as a whole. But fret not, because with the guide below, you will be making the most of your time here as you base yourself in the capital city of Kathmandu! Where to Stay in Kathmandu? Come and check out my list of the ‘Best Hotels in Kathmandu‘ which features the top recommended choices for cheap to luxurious accommodation choices. With such a dynamic city like Kathmandu, there are definitely a lot of attractions or landmarks that are worth seeing, but to start off, below are some of the spots that you absolutely must NOT miss! ★ Pashupatinath: This is a sacred Hindu temple complex which serves as the seat of Nepal’s national deity, Lord Shiva (one of the principal deities of Hinduism in which Pashupatinath or Pashupathi is one of his given names). As the oldest Hindu temple in the city, you will find a sprawling mix of temples, ashrams (spiritual monasteries), images, and inscriptions from the moment that you set foot in this place. TIP: If you want a unique experience, you can visit in the morning to see them do cremations or visit in the evening from 6PM to see the aarti (worship with fire). ★ Boudhanath: Dominating the skyline of Kathmandu, this is a well-known stupa (place of meditation) in which its massive mandala (spiritual symbol in Buddhism) makes it one of the largest spherical stupas in Nepal. It helps to note that for centuries it has stood as a beacon of Buddhist belief and has since been an important place of meditation and pilgrimage for a lot of local Nepalis and Tibetan Buddhists. Swayambhunath: This is an ancient religious architecture that contains shrines, temples, a stupa, a Tibetan monastery, a museum, and a library — moreover, it is also surrounded by ‘holy monkeys’ (as per mythology) which made it gain the nickname: ‘Monkey Temple’. Although this site is considered Buddhist, it remains to be revered by both Buddhist and Hindus. TIP: To get a great panoramic view of the stupa, enter the Tamang Gompa monastery. Meanwhile, for a less crowded environment, it’s best to come either early in the morning or early in the evening. ★Durbar Square: ‘Durbar Square’ is a generic name used to describe plazas that are opposite old royal palaces in Nepal, and this particular Durbar Square in Kathmandu city is surrounded by spectacular architecture that showcases the skills of Newar (historical inhabitants of Kathmandu Valley) artists for centuries. Regrettably, some of the buildings here have collapsed because of the big earthquake that happened last 2015 — however, the beauty of this square remains due to its astounding palaces, courtyards and temples. Old City: Make sure that you explore this tangle of narrow alleys and temples that are found north and south of the central Durbar Square as one of your things to do in Kathmandu city, so that you can also get a closer look into the local’s culture and way of life. Other Durbar Squares: If you have the time, check out the other Durbar Squares found in the Kathmandu Valley (at Patan and Bhaktapur). Garden of Dreams or Swapna Bagaicha: If you want to find a space that is away from the hustle and bustle of Kathmandu, the serene atmosphere of the beautifully-restored neo-classical Swapna Bagaicha or Garden of Dreams will be your wanted respite. In here, you can enjoy a vast garden that has 3 pavillions, an amhitheater, ponds, urns, and pergolas (walkways). Wanna do a guided Kathmandu tour? With the help of a local guide, you can take part in a 7-hour Kathmandu day tour which will cover all of the city’s top highlights and UNESCO spots. To book your spot, go here. #2 – Go through Thamel and have some fun! 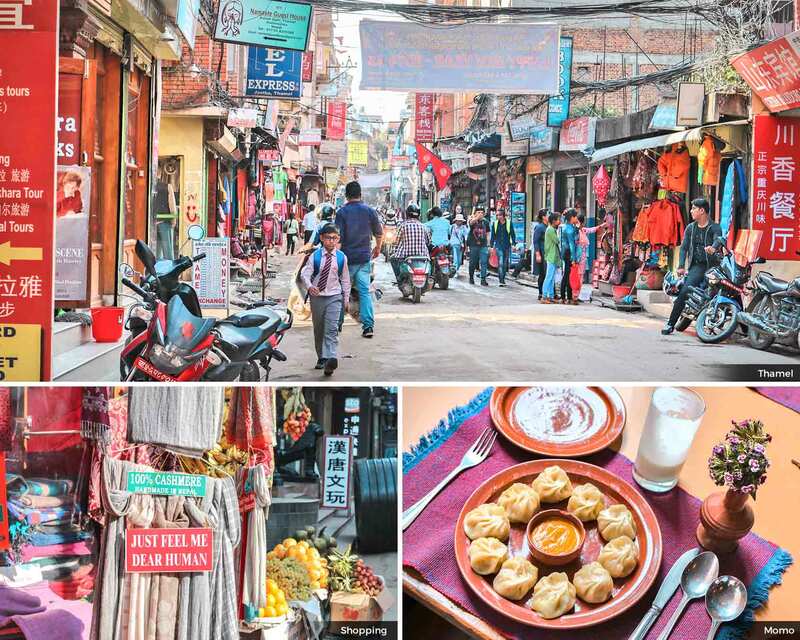 If you’re looking for the liveliest commercial neighborhood in the city, you only need to head to Thamel which is distinguished for its narrow alleys that are filled with various buildings and vendors: clubs, hotels, hostels, pubs, restaurants, shops, tour operators, and more — you really will find almost everything here! Stuff yourself with local food: First and foremost, eat “momo” which is a steamed dumpling that’s native to Nepal and Tibet. If you’re rather looking for a full meal option, get a “thali set” which holds several bowl selections such as rice, curry, pickles, vegetables and “dal bhat” (a staple food in Nepal that is a thick lentil soup). Meanwhile, for dessert, look for “sel roti” which is sweet and crispy on the outside, and soft and chewy on the inside. Do some classes or workshops: There are a number of shops in Thamel that can, for instance, teach you how to cook Nepali cuisine, do Buddhist thangka paintings, make woodcarvings, and more. You could even enroll in an amazing yoga class or retreat! Your activity choices are absolutely endless. TIP: If you’re rather looking for authentic bazaar-esque places, head on over to either Asan, Indrachok or Mangal bazaars. Let’s face it: a lot of us are NOT prepared to scale the summit of the world’s highest peak; so thankfully, as part of your things to do in Kathmandu, there are providers in Nepal that gives anyone the chance to get a bit close to the Himalayas and see the beauty that is Mt. Everest. Of course, nothing beats the experience of trekking up to the summit or to the Everest Base Camp — BUT, if you can’t do that, then why not just fly there, right? Besides, you’ll be among the lucky few who can get to witness this majestic mountain range from up high in just a few hundred meters away! Yet… as you would expect, this is NOT entirely cheap; but for sure, it will certainly be worth it! Lasting from 45 minutes to an hour, most flights start from around $150 and there are 2 options for you to choose from: doing it by helicopter or by plane. There are a lot of tour operators who offer helicopter rides, but when it comes to aerial rides, there are 3 airlines who are well-known for doing it: Buddha Air, Guna Air and Yeti Air. Wanna book an Everest flight? For a hassle-free experience, you can book your Everest mountain flight here. Subject to schedule availability, this flight tour will be made through Buddha Air, Yeti Air or Simrik Air. TIP: Book a flight during the earliest part of the day for the leat chance of getting cloudy or bad weather. NOTE: If in case you don’t have the budget to fly nor the capacity to hike/trek, there is another option for you to see Mt. Everest “up close”. Aside from the obvious fact that you just go to places or towns that have a clear view of the Himalayas, you can also get an ‘aerial glimpse’ from up high on the plane when you get in or get out of Nepal — provided that you pick the right seat. For example, if you’re flying to Nepal from Southeast Asia, reserve a window seat on the right (those labeled letter K, for example). And when flying back to Southeast Asia from Nepal, go for the left seats (letter A’s). You can always ask for tips from the airline you’re flying with to be sure! Hiking/Trekking: There are a number of amazing hikes that you can do around the valley such as Chisapani, Champadevi, Nagarkot, and Nagarjun. You could also go to to the high peaks of Shivapuri National Park, or if you are up for a longer hike, there is a 6-day trek from Kathmandu to Langtang National Park (the 1st Himalayan national park in Nepal). All in all, I can assure you that the sights will be stunning — more so when you get to see the surrounding terrain during sunrise or sunset. River rafting: If you seek this kind of adrenaline-pumping activity, you can opt to go for a river rafting tour that goes through Trishuli River which connects the city of Kathmandu to Pokhara. To reserve your spot for this adventure, go here. Mountain-biking: You will notice that when you go through Thamel, there will be a lot of shops who offer guided mountain-biking trips or who simply offer bikes for rent. If you’re up for this, I say do it because the adventure will be worth your while! Rock climbing: If you’re looking for something to climb that is not Mt. Everest, there are several options for you in the heart of Kathmandu. First up, in case you are not ready yet to go for natural cliffs, there is an Astrek Climbing Wall in Thamel. Otherwise, great natural climbing cliffs can be found at Hattiban (Pharping) and Nagarjun. Wanna fully escape the traffic and urban setting found in Kathmandu? There are several charming towns and cities that you could explore during your time there. Bhaktapur: As one of the ancient cities that make up Kathmandu Valley, you will enjoy how this place has the most temples per square kilometer in Nepal! Truth be told, it has the best-preserved palace courtyards and old city center in the country. TRANSPORTATION: (Less than 1 hour away). Ride a bus at Bagbazar or Ratna Park that costs about 50 NPR (less than $1), or get a taxi that will cost you around 1,000 NPR one way ($9~). (Otherwise, you can also join a Bhaktapur Tour with a stopover at Patan here). Lalitpur or Patan: If Bhaktapur is the most Hindu of the cities in the Kathmandu Valley, Patan would be the most Buddhist (and Kathmandu is somewhere in the middle). Anyhow, much like Bhaktapur, Patan has an array of similar architecture; however, the plus side of going here is that it is much closer to Kathmandu city itself so it makes for a great side trip if you’re pressed on time. (If you can come early in the morning, you should go to the Golden Temple to hear the beautiful chanting music made by the choir). TRANSPORTATION: (30 minutes away). Ride a bus at Ratna Park or a blue/green bus at Ring Road which will cost about 15 NPR (less than $1). Taxis, on the other hand, will be about 200 NPR ($2~). (Otherwise, you can also join a Patan Tour with a stopover at Bhaktapur here). Bungamati and Khokana villages: Regrettably, a lot of the key structures in these villages have been destroyed due to the 2015 earthquake — but it is more of a reason why you should come visit in order to help raise tourism and aid them in quickly restoring their temples. After all, in its prime, these 2 villages have been revered as two of the prettiest villages in the valley. TRANSPORTATION: (Less than 1 hour away). It’s preferable to get a day tour that covers both of these villages. To reserve a spot, go here. Panauti: – This is one of the oldest towns in Nepal and its nostalgic charm remains up to today, making it a great day trip for your things to do in Kathmandu. Personally, I thoroughly enjoyed going through its quaint streets during my visit. I even had the amazing opportunity to do a homestay with a local family and it was one of the most enriching experiences that I’ve had! TRANSPORTATION: (Less than 2 hours away). Ride a bus from Ratna for around 60 NPR (less than $1~). Taking a taxi will be more expensive at about 2,500 NPR ($24~). Nagarkot: – Just about 32 kilometers away from Kathmandu city by car, this has since been known as the top spot for enjoying Himalayan views, sunrises, and sunsets. Aside from this, its lush forests makes it a great spot for relaxation and outdoor activities — so why not make a visit here as one of your things to do in Kathmandu? TRANSPORTATION: (Less than 2 hours away). Ride a bus at Bakhtapur Bus Terminal at Ratna Park, and from Bhaktapur you can get to Nagarkot (total of about 70 NPR or less than $1~). Since this can be quite a hassle, it’s rather best to get a private car for hire or a taxi which can be around 3,000 NPR ($30~). Kirtipur: Located right next to Patan, Kirtipur is one of the most famous and religous places to visit in the valley of Kathmandu. You will absolutely love the clean air as well as the majestic Himalayas that pain the background of this ancient city. TRANSPORTATION: (About 30 minutes). Ride a bus at Ratna Park for less than 50 NPR (less than $1~) or get a taxi for approximately 500 NPR ($5~). Spring: March to May with pleasant temperature averaging from 16ºC to 23ºC. This is the 2nd most popular season with its warmer days and flower blooms such as the rhododendrons which is the national flower of Nepal. The only con for traveling during this time is that there’s higher chance of haze that will obscure the mountains from lower elevations. Summer: June to August, hot and wet, averaging from 23ºC to 30ºC. There is high humidity and there’s rain almost every day so it’s not an ideal time to visit especially if you want to explore the nature. (But city visits is fine since there will be lesser crowds). Autumn: September to November with cooler temperatures, averaging 15ºC to 25ºC. This is the best tourist season given that the weather is more pleasant, bringing in clearer views of the mountains. Furthermore, big Hindu festivals like Dashain and Tihar happen during these months so it can get quite lively. Winter: December to February with cool weather averaging 9ºC to 12ºC. This is also the season where the skies are clear, but just make sure that you are well prepared especially when going out on treks since the temperature drops significantly at night time. 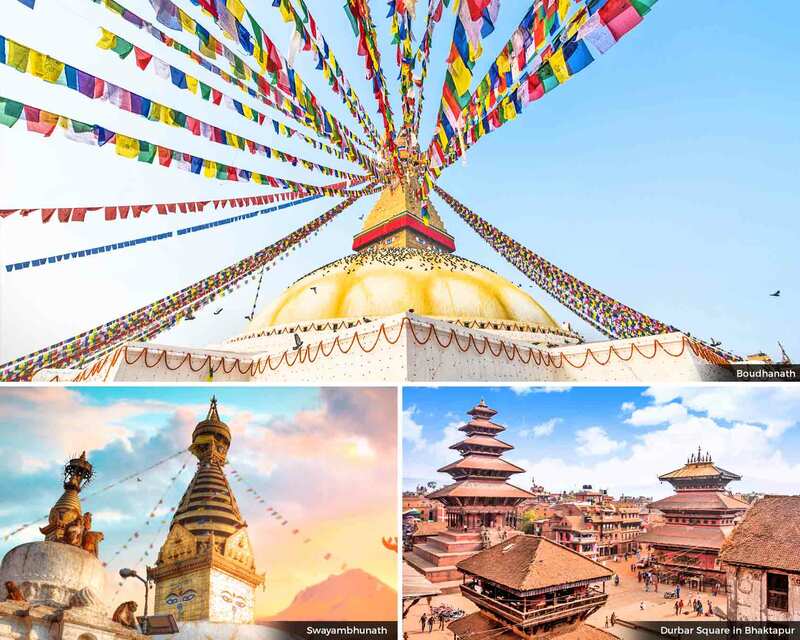 Where to get the best flight promos to Kathmandu? My go-to platform for grabbing the best flight deals is Skyscanner since it scans all possible airlines that fly to and from your destination. I can even set up alerts so that it notifies me when the prices suddenly drop or rise. Nepal’s main international getaway is Tribhuvan International Airport (KTM) which is located about 6km from Kathmandu city. In order to get to the center (such as that of Thamel), you can arrange a hotel transfer, a prepaid taxi (approx. 700~ NPR), a regular taxi (approx. 400~ NPR), or a bus (approx. NPR 10~). How to change your money into Nepal currency? Nepal’s currency is called as Nepalese Rupee (NPR). I highly advice that you do NOT exchange your money at the airport since the rates there are totally not competitive. What should you rather do? Either exchange your money or US dollars at a bank or at a money exchanger in your home country or in Kathmandu’s thamel; or better yet, just withdraw from an ATM with your debit/credit card. Remember to keep the exchange receipt because you will need it when you need to change back your NPR to your original currency. Where to best stay (for accommodations)? To see a complete list of the top recommended accommodation chances ranging from cheap to luxury places, check out this post of the ‘Best Hotels in Kathmandu‘. How can I go around Kathmandu? Some places can be reached by foot, but since it can get quite chaotic due to the lack of street names, it’s best to either get a rickshaw especially if you don’t have Google Maps on hand to navigate your way as you execute the above list of things to do in Kathmandu. Rickshaws can be found everywhere and prices can start at 15 NPR — but it’s highly likely that the driver will set a higher price, so feel free to haggle. Meanwhile, taxis and green or blue buses are more ideal if you want to go to far places inside or outside of the Kathmandu Valley. Taxis are also not that hard to find especially in the day (it gets harder at night though) and cost can start at 300~ NPR if, let’s say, you want to get to Patan. As for buses, you can find them around the city or on the ‘Ring Road’ and the cost can start from 20 NPR. Just take note that the buses are quite old and it’s not entirely comfortable. Should I get a visa to visit Nepal? Yes, ALL foreigners (except Indians) are required to have a visa to visit Nepal. Rest assured, the process is fairly easy and fast. To know the whole process and details, see my ‘How to Apply for a Nepal Visa on Arrival‘ guide. Many local Nepalese have no difficulties speaking English as a second language, and it becomes more prevalent when you’re in the capital of Kathmandu. But of course, it doesn’t hurt to learn a bit of Nepali. Much like what I experienced, I hope that this list of things to do in Kathmandu will help you capture the best of the valley’s cultural and natural highlights. Sure enough, there is a dizzying number of activities and sights for you in this destination but I can guarantee you that the things listed above will already give you a great Nepal experience that will be worth your time and money. Enjoy! DISCLOSURE: Thank you so much to the Himalayan Travel Mart 2017, PATA and PTBA for making this Nepal trip happen. What things to do in Kathmandu would you best like to do or see? Or have you been here before? Do you have any other tips to add? Will be saving this! Next trip to Kathmandu. Wish you can visit soon! I have never been to Kathmandu but I always wanted to visit. Such a wonderful place. Wow, such a detailed post that would be so helpful to plan a great trip to Kathmandu. Loving the pictures so much. Nepal is an amazing place and it is full of historical things. It is one of the best attraction. Stunning photos you shared that beautiful place. What an awesome destination. I am sure many are turned off by the distance (culturally and physically) to travel to get there, but that is part of the charm, the exclusivity. You have done a wonderful job representing this place as a place worth seeing in person. True that! I bet anyone will fall in love even with the gritty side of Nepal ;) Thanks Penny! I hope you get to visit here too! A few years ago, I came so close to taking part in a 6-month volunteer program in Nepal. I had a feeling it would be the most beautiful place I had ever visited, but alas, it wasn't my destiny. :( Now that I see your photos and tips, I'm re-inspired to travel there. I think it could be the trip of a lifetime! Oh no, I'm sorry to hear that! But I hope you could soon arrange another trip here!